The Legal Genealogist is getting ready to head off to Detroit and Saturday’s big event: the 10th Annual Family History Festival at the Detroit Public Library, co-sponsored by the Detroit Society for Genealogical Research, Fred Hart Williams Genealogical Society, Detroit Public Library Friends Foundation, and the Louisa St. Clair Chapter, Daughters of the American Revolution. My ancestors generally were from a bit further south1 so getting to see what resources there are for Michigan research is a real treat. 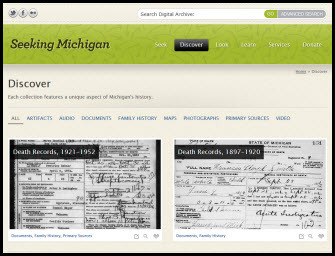 Vital records are key to any genealogical research, and the Michigan Historical Center’s Seeking Michigan website has links to some anyone with Michigan roots needs to know about. Death records are there in large numbers in two digital collections: Death Records, 1897-1920; and Death Records, 1921-1952. For the former, there are nearly one million death records created between 1897 and 1920. For the latter, records created up to 1939 include an image of the death certificate; later records are index-only. The Library of Michigan has a guide to Michigan vital records on its website so you can see what research you can do onsite. Newspapers are always key to tracking any family’s history, and the Michigan Digital Newspaper Portal has links to many digitized newspapers from throughout the state. • the Detroit Gazette (1817–1830), through Google News. And there are many more from different time periods, or on pay websites. Legal research is key to understanding many records, and we talked about that yesterday.2 For additional help in researching the law in Michigan, check out the online chapters from Locating the Law: A Handbook for Non-Law Librarians in Michigan, a workshop from the State Law Library. The information has to do more with modern legal research than with historical research, but some of what’s there can be very helpful. So… if the 10th Annual Family History Festival is at the Detroit Public Library, why am I not listing the resources of the Detroit Public Library? Because that’s a post for another day … tomorrow, to be precise.